Racing is one of the best parts of sailing for many boat owners, and the members who sail at Thames Yacht Club (TYC) of New London CT are no exception. TYC is a family boating club with a racing heart. 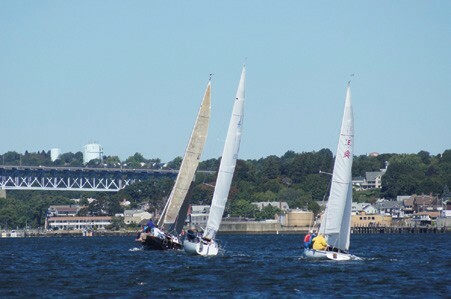 TYC hosts a number of racing events and series throughout the sailing season and the annual Commodore’s Trophy Race, an Eastern Connecticut Sailing Association event, is one of their biggest. Last year’s 69th Annual Commodore’s Trophy Race is a fine example of how TYC brings together a great day of racing, celebration and friendship! The morning started overcast with little wind while 38 boats and crews from around Long Island Sound and Fishers Island Sounds prepared for the race. But by the time the first warning went off just before 11 am, the sun was beaming in a brilliant blue New England sky with winds blowing between 25-30 mph. It promised to be a great day of sailing. The race started and finished in the vicinity of the Vixen Ledge buoy. Great racing conditions meant lumpy seas at anchor, and the race committee braced topside for a long day. Rocking and rolling on a hook meant there would be no below deck conferences on the committee boat. There was a little extra excitement for the committee boar just as the race got underway, when a competitor tangled with the committee boat’s anchor line! The race was promptly postponed as level heads prevailed: The anchor line was sheared and the committee boat anchor found a new home at the bottom of the Thames River. A second anchor was quickly secured and the race happily resumed. Good sailors are always prepared! In another incident, the mast of an Ensign snapped, forcing the crew to withdraw from the race. Fortunately, no one was hurt in either situation. Not all the fun happened out on the water. Racing and non-racing sailors, family members, friends and guests gathered on the beach outside the clubhouse for the post race party and award ceremony. TYC provided an outstanding meal of steamed clams, mussels, corn-on-the-cob, clam chowder and a huge variety of salads and deserts. Lots of refreshments were available to keep hydrated while the popular ‘Dark ‘n’ Stormy’ tent was busy serving its namesake drink in addition to beer and wine. Guest moorings were available to those boats and crew who came a distance to participate, making it a safe and comfortable party for all. Of the 38 boats that started, 34 finished. Handsome carved glass trophies were awarded among Canvas, Spinnaker, Ensign, Nonsuch and J/70 classes. First place finishers in each of seven classes were Tom Doyle’s KISS 44 Bagatelle (S1), Tom Welsh’s J/30 Blackbird (S2), Stu Craig’s J/27 Goombay Smash (C1), Ted Paulsen’s Tartan 30 Skirr (C2), Robin Durrschmidt’s Magic (Ensign), Cat’n Mouse (N) and Will Lennon’s Freedom (J/70). The Commodore’s Trophy Race is one of many racing, cruising and membership events held throughout the year at Thames Yacht Club, a friendly and social boating club where new members are always welcome. TYC is situated at the mouth of the Thames River on Pequot Avenue in New London, CT, ideal for both boaters and beachers to enjoy the beauty of Connecticut’s shoreline and waterways. TYC’s 2017 racing season promises to be another great one, so come check us out or visit our website at ThamesYC.org.